This interesting name is of Norman, French, origin, introduced into England sometime during the 12th Century when there was a great deal of trade between the two countries, and consequent immigration by both country's nationals. The Surname is locational, and derives from the place called "Sainville" in Eure-et-Loire, so called from the Old French "Saisne", Saxon, as in the German tribe and Ville, settlement. The Savilles have held lands in Yorkshire since the time of King Henry 111 (1216 - 1272), and Lord Saville was a strong supporter of the Parliamentary side in the English Civil War (1642-1651). The name development includes Stephende Savile (1277, Yorkshire), Rosemunda Savell (1549, ibid. ), Ann Sivill (1671, London), and John Sivell (1723, ibid.). 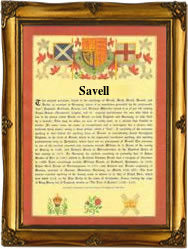 Other variants of the modern surname include Saville, Savill, Savil, Saveall, Seville and Saywell. John Payne and Fridiswith Saville were married in London in 1611. The first recorded spelling of the family name is shown to be that of John de Sayvill, which was dated 1246, in the Yorkshire Fines Court Records, during the reign of King Henry 111, known as the Frenchman, 1216 - 1272. Surnames became necessary when governments introduced personal taxation. In England this was known as Poll Tax. Throughout the centuries, surnames in every country have continued to "develop" often leading to astonishing variants of the original spelling.